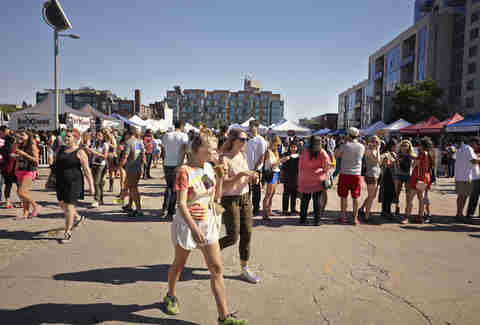 Smorgasburg, or the outdoor gorge fest where you found true love via fistfuls of sandwiches last year, is returning to make your weekends better starting early next month and this year's lineup of new vendors is packed with great new food. The team at Brooklyn Flea selected a bunch new vendors after doing almost 100 tastings from 300 applicants throughout winter, including Best Buds Burritos, The Imperial Egg, Piece of Velvet, and a boat load more (check 'em all out below). 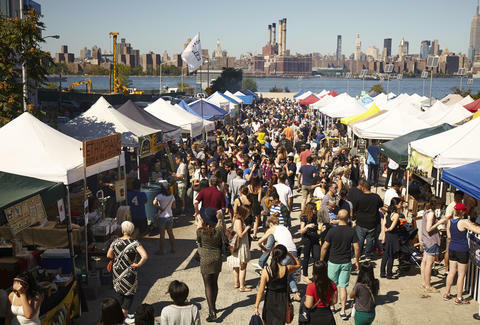 And don't worry -- it's all just less than two weeks away, opening April 4-5 with the Saturday Smorgasburg at East River State Park and the Sunday Smorgasburg at Brooklyn Bridge Park Pier 5. Antica Pesa: Owner Francesco Panella has created some items just for the fest that you won't find at his Berry St restaurant -- a frittata di pasta aka the "spaghetti burger", eggplant parmagiana, and pizza bianca. Best Buds Burritos: Prepare yourself for their San Diego-style burritos because they're stuffed with carne asada, cheese, guacamole, crema, salsa, oh, and french fries. Big Mozz x Atlantic Ave. Co.: This is where you'll be able to get your hands on what's called a mozzarella "bomb," or mini ball of mozzarella filled with pesto or sauce. Birds & Bubbles: This fried chicken and champagne restaurant will be serving up some Nashville hot chicken on a biscuit along with deviled egg sauce and dill pickle. The Cardinal Bakery: This bakery is bringing its vegetarian sandwiches to Smorgasburg, like a broccoli cheddar sando with picked red onion and mustard on sourdough bread. Oh, and apparently they've got moist peanut butter and jelly cookies. Curd’s the Word: Cheese curds are a fried favorite in a bunch of states across the Midwest and the Northeast, and this vendor is set to fry 'em up plain or buffalo style. Dorset Maple Reserve: This small-farm operation out of Southern Vermont will be selling bottles of syrup, and things like bacon-maple candies. Duck Season: Count us in for some duck confit that comes on duck sandwiches or right on the bone, along with some duck fat-fried potatoes. Lo.Li.tas: Get "happy porks" sliced right off the bone and into sandwiches at this stand by a famed importer of Iberico Spanish ham. Goa-Taco: Here's where you'll find paratha tacos, aka tacos made with a buttery, flaky croissant-tortilla hybrid that're filled with all sorts of things like pork belly, chicken chorizo, lamb shoulder, and more. The Imperial Egg: Visit this stand which boasts Scotch eggs rocking awesomely innovative twists on the classic pub food, like spiced lamb and yogurt, chicken sausage with sweet soy aioli, or vegetarian butter bean and cheddar with enchilada sauce. Manousheh: After opening a shop on Bleecker St in Geenwich Village, this Lebanese flatbread purveyor is coming to Smorgasburg with this popular sweet or savory street food. Piece of Velvet: Red velvet, blue velvet, green velvet -- this bakery has all of the delicious velvet cakes and cupcakes. Rise & Swine: The stand comes from the team behind El Gato Nacho and will feature home-cured bacon on breakfast sandwiches ... because that's where bacon belongs, obviously. One such bacon creation will be a toasted potato bun somehow containing peppercorn and aged soy bacon, avocado, quick-pickled cucumber, pickled ginger, and Lap Chong sausage. Shuka: You might have seen their food truck, and soon you'll be able to get some shakshuka at their new stand. Snowday Sugar Shack: This project by Drive Change has picked up quite a bit of attention lately for employing formerly incarcerated Rikers Island teens, and they'll be offering “Sugar on Snow” at their stand, or maple syrup rolled in "snow," and served on a popsicle stick. The Stand: This hot coffee vendor for the Saturday Smorgasburgs will offer coffee from Cafe Grumpy. Tango Chile Sauce: The Smorgasburg folks said they love this new Brooklyn-based line of hot sauces for sweet, salty, and fresh vinegar-based taste. Now, you'll have to go around putting it on everything. Tink’s Red Ginger Cocktail Sauce: In other sauce news, this stand bravely throws out conventional cocktail sauce's horseradish base and uses ginger instead. Save a horseradish, ride some ginger? 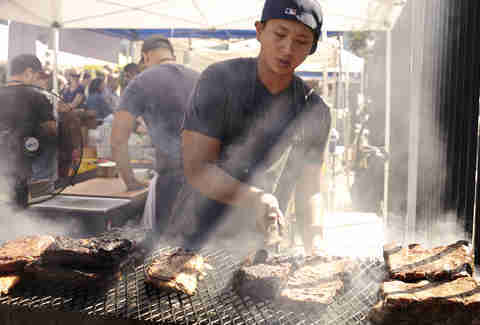 von Kava: This isn't your typical food fest stand. Jonathan Kava of Mas Farmhouse, is creating a sit-down booth and a pretty awesome-sounding tasting-menu. 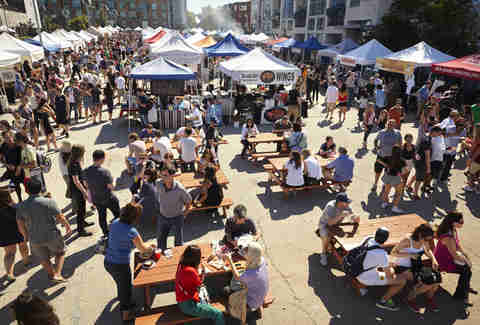 Smorgasburg said you can expect a 4-course tasting of things like a crab fritter with bacon beurre blanc, white asparagus soup with charred ramp, poached cod with pickled fiddlehead and smoked shitake, pork loin with smoked gnocchi, carrot stew, and a caramel petit four for dessert. Tony Merevick is Cities News Editor at Thrillist and needs more food festivals in his life. Send news tips to him at tony@thrillist.com and follow him on Twitter @tonymerevick.